Tips | Graves Heating and Air Conditioning Services, Inc.
HVAC Emergencies come in all shapes and sizes. Plan ahead, be safe, and be prepared. While many organizations have an emergency-preparedness plan in place to deal with unexpected disruptions, very few have a plan in place to deal with HVAC equipment failures. When a heating and cooling unit fails, and there is no plan in place to deal with the failure, it can result in the loss of thousands of dollars. The best thing organizations can do is include a plan to deal with HVAC emergencies in the emergency-preparedness plan that is already in place. The first step that needs to be taken when developing the emergency-preparedness plan for heating and cooling system failures is to identify any equipment failures that would disrupt business operations. The most important determination is whether a disruption would be localized to specific areas of the building, or if a disruption would be building-wide. Localized disruptions are easier to plan for in case the heating and cooling system in the building fails. If the disruptions are limited to a localized area in the building, it will need to be determined whether or not normal operations can continue in that area or if they will need to be relocated to other parts of the building. If the failure of the HVAC system will cause building-wide disruptions, then the plan will need to include a way for providing heating and cooling with temporary equipment. With building-wide disruptions, it becomes a high-priority to take care of the issue. While some areas of the building may still be able to function without HVAC services, it is more likely that an equipment failure will disrupt operations significantly. Including a plan to deal with a HVAC emergencies within an organization’s total emergency-preparedness plan is something that shouldn’t be overlooked. Having service disrupted due to the failure of a building’s heating and cooling system can cost an organization thousands of dollars. This impact can be lessened by simply taking the time to put a plan in place. Talk to your HVAC service provider to ask if they can help you make a plan. If your AC needs repair or service in the Southern California area, please call Graves Heating and Air Conditioning Services, Inc. at 562-944-2118 to set up an appointment. Be sure to weigh the pros and cons before getting rid of your old system and buying a new HVAC system. A good HVAC system should last between 20-25 years. If your current system is old, becoming noisy, and isn’t operating at top efficiency, it may be time to purchase a new HVAC system to replace your old one. As you start to look at new systems, you’ll want to keep the following pros and cons in mind. Consistent Temperature – the unit pushes cool air through vents that are found throughout the entire house, giving you cool air everywhere in your home. Filtered Air – not only are HVAC systems designed to provide cool air, they also work to provide cleaner air. Programmable Thermostat – you are able to program when the system turns on, as well as setting the temperature. This helps decrease energy costs by reducing the time your system is working. Cost – new systems are expensive to purchase and have installed. Replacement Filters – they will need to be replaced regularly. Many are inexpensive, but there are some brands and sizes which can get costly. Replacing your old, malfunctioning HVAC, system will help keep your home cool. Before you make a decision on a new system, you will want to talk to a certified HVAC technician to help you determine, which system will benefit you the best. Also, please see our post on when to replace your old system with a new HVAC system. If your AC needs repair or service in the LA Metro area, please call Graves Heating and Air Conditioning Services, Inc. at 562-944-2118 to set up an appointment. Two workers on the roof of a building install HVAC upgrades. Being a facility manager is hard enough without having to repair or replace a building’s HVAC system. While many HVAC upgrades go smoothly, there is always the chance that upgrading the building’s system will be riddled with issues. While there is no way to predict the outcome of a project, paying attention to all the details can help to avoid some of the major problems that may arise. When the building’s heating and cooling system aren’t functioning properly, there may be pressure to simply replace the malfunctioning system. While a complete system replacement is an option, it is important to know why the system isn’t working properly. Once you know what is causing the HVAC system’s performance issues will you be able to know if the entire system needs to be replaced or if repairs can fix the issue. One problem that can cost you is a lack of or conflicting documentation. In order to review problems later on, change orders, design alterations, equipment substitutions, and programming revisions need to be put into writing. This is the only way to keep everyone involved in the HVAC upgrades process accountable. 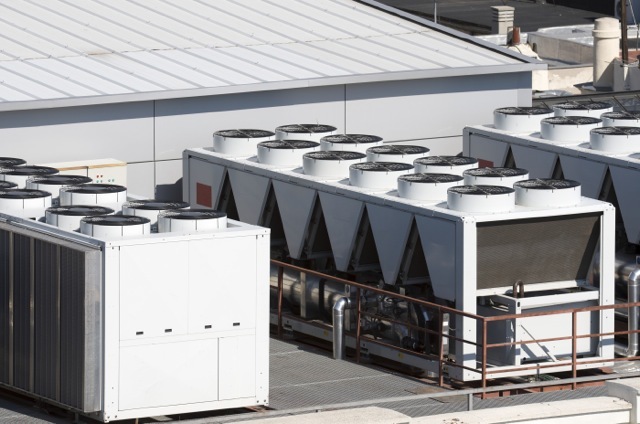 When working on upgrading a building’s HVAC system you need to make sure you have the proper plans and specifications for the system you are installing. You want to ensure that the system you have chosen meets the requirements and specifications that you have laid out for the building. By having the plans and system specifications in writing you will know what should be happening and which items should be included in the install. Planning HVAC upgrades for a building takes a lot of forethought and attention to detail. While there is no guarantee the upgrade process will run smoothly, there are a few things you can do to help avoid some of the more common problems that may arise during the process. If you need a commercial HVAC service provider in the greater Los Angeles area, please call Graves Heating and Air Conditioning Services, Inc. at 562-944-2118 to set up an appointment. Industrial air conditioner controls displaying new technologies for HVAC systems. Commercial HVAC systems are expensive to run. Critical to keeping the occupants of a building comfortable, they have become unavoidable. The older heating and air conditioning units use a considerable amount of energy to operate. In fact, they account for more than half of the entire energy consumption of a commercial building. The good news is there are a number of energy saving technologies on the market today to help cut the costs associated with the use of commercial HVAC systems. Demand Control Ventilation – this technology combines carbon dioxide sensors with economizers in order to sustain air levels within a suitable range while preventing over ventilation. Dedicated Outdoor Air Systems – conditions outdoor makeup air, or the outdoor air that hasn’t been recirculated, independently from indoor return air improving humidity control. Displacement Ventilation – improves indoor air quality by using a low speed stream of cold, fresh outdoor air that is supplied at the floor level of the building. This action displaces the stale air that accumulates at ceiling height which is vented from the building. The continued circulation keeps the air clean. Micro Environments – creates a virtual zone for occupant environmental control. Using an online interface, each occupant within the building is able to control the temperatures within their own areas increasing staff comfort and productivity. Variable Flow Volume Systems – a ductless system that is flexible in capacity and design. They use multiple compressors and provide partial-load performance as well as zoned temperature control. These new technologies can provide a significant reduction in energy used, which will result in cost savings. They are not appropriate for all situations. The best things to do is talk to a knowledgeable contractor to find out if any of these solutions would be right for you. If you need a commercial HVAC service provider in the Southern California area, please call Graves Heating and Air Conditioning Services, Inc. at 562-944-2118 to set up an appointment. HVAC Efficiency is key for saving money on your heating and cooling costs. When temperatures begin to soar, your HVAC efficiency is put to the test. As the system works to keep your house cool, it can begin to wear down and need repairs. The harder your HVAC system has to work, the less efficient it becomes and the more energy it needs to operate. When your HVAC system becomes less efficient and it starts costing you more money to keep your house cool, it may be time to start looking at some options. HVAC systems are expensive, complicated and aren’t immune to wear and tear. If you’ve noticed an increase in your energy bill, you may need to call a technician and have your HVAC system serviced. By servicing your HVAC and taking care of any minor repairs that may arise, you can cut your energy costs by up to 20 percent, according to the EPA. There are times however, when repairing the system isn’t an option. Find a system with the USEPA’s Energy Star Seal. Purchase the model with the best HVAC efficiency for your needs if the Energy Star doesn’t rate an option you require. Look for other energy-saving features such as a programmable thermostat and power-saving functions. Look for equipment that uses as little energy as possible while in the “off” mode. When the temperatures are scorching and you want to cool your house down in a hurry, you want a HVAC system that is operating at top performance. If you are not able to keep your house cool or you notice your energy bill is rising, it may be time to make repairs or replace your system all together. A skilled service provider takes the worry out of keeping a mission-critical industrial HVAC system running. A commercial HVAC system is an important aspect of any business. Your HVAC system is responsible for keeping not only your employees, but also your customers comfortable. The right commercial HVAC system can help a business save more energy and help to increase the workers’ productivity. They use a high efficiency industrial air filtration system to help control the indoor air quality. For certain companies, having a quality industrial HVAC system isn’t an option. When you’re dealing with high-tech equipment and expensive tools, it’s important to have a system that is capable of removing dust, eliminating harsh fumes, and removing other air-borne contaminates. It is also instrumental in protecting the equipment from over-heating or freezing. Each of these types of business relies heavily on an industrial HVAC system’s ability to keep the climate within the building stable and protect the equipment against extreme humidity, which can damage the sensitive equipment that is used within these industries. A building’s HVAC system isn’t solely for keeping your employees and customers cool and comfortable. It can also, when properly maintained, ensure that expensive equipment and tools are protected from temperature extremes and from becoming damaged due to humidity. If your industrial HVAC system needs repair or service in Southern California, please call Graves Heating and Air Conditioning Services, Inc. at 562-944-2118 to set up an appointment. A complex system, your HVAC unit includes a number of heating, cooling and ventilation components that work together to keep your home cool and comfortable. The individual components of your system can break down and begin to function poorly, affecting the operation of your system. While there are a number of malfunctions that can affect how your HVAC system operates there are five common problems that are easy to fix and they won’t break the bank. If you’ve noticed a change in the overall temperature in your home, and your cooling unit is not consistently turning on or off, then you may have a broken thermostat. You can determine if you need a new thermostat by placing the unit’s fan on auto and listen to the fan blades turn. If the thermostat is listing the room temperature as your target temperature, and the fan is still running, then the thermostat needs to be replaced. If you notice that some rooms in your home seem to cool or heat much faster than others, it may be because your dampers are improperly balanced. If you are experiencing uneven temperatures from room to room, your system dampers may be unbalanced. You may want to call a service technician to come out and service your system. In order for your HVAC unit to properly cool, it needs liquid refrigerant, also known as Freon. If you notice that your home is not getting cold, even though your cooling system seems to be working overtime, it may mean your refrigerant is leaking, and you need to call a service technician ASAP. If your cooling system is completely unresponsive, it may be something as simple as a tripped breaker. You can simply go to your breaker box and flip the designated switch back to the “on” position. However, if your system trips the breaker regularly, you need to call a qualified HVAC service company to take a look at what is causing this issue. See our related post on this issue. There are a number of reasons why your HVAC problems may be occurring. Before calling a service technician and spending your hard earned money, you may be able to fix the problem with little work. If your AC needs repair or service in Southern California, please call Graves Heating and Air Conditioning Services, Inc. at 562-944-2118 to set up an appointment.